Most people know that we have not been assigning any long-term campsites since March 2015. Other than trailer sales, long-term sites that were relinquished became short-term campsites. As we explained in the March 21, 2015 blog post, the cause was an individual who managed to convince the Landlord Tenant Board (LTB) that he was protected by the Residential Tenancies Act (RTA). For the reasons explained in the blog post, this was very problematic to maintaining a naturist environment. That, combined with some other changes we made, means that we now feel comfortable starting a new waiting list. However, the policies and procedures have changed based on what we've learned. We will favour intensification of sites. For example, a couple will get higher priority than a single person. People with children will get priority since naturism is beneficial to their development and they grow up fast! People with a dedication to naturist values and Bare Oaks Family Naturist Park will also be favoured. As some people prefer unserviced campsites, there will now be separate serviced and unserviced waiting lists. Members will no longer be able to automatically switch between campsite levels. This revised policy applies only to the waiting lists. Trailer sales will continue as before. We realize that this revised policy will please some and disappoint others. Ideally we would have enough long-term campsites for everyone who wants one. If we can manage it, we will add more in the future. But for now, we believe that this is best for Bare Oaks Family Naturist Park. Photo: Aerial of Beckett Circle by Marc Deschênes. Airplane ride courtesy of Ron Schout. The summer water system has been successfully disinfected and flushed so all campsites now have access to potable water. The toilets in the Beckett Circle comfort station are working. But the indoor showers are being renovated because we discovered that several of the walls were rotting. We thought that they would be open by now but some of the parts are coming from Europe so it is taking longer than expected to receive them. But the outdoor showers are working! Of course, the temperature is a bit cool in the morning even with lots of nice hot water coming out. So if it is too cold outside for you, the showers in the clubhouse are your best option. Success is a wonderful thing but it can also create some challenges. As many people know, demand for camping space has exceeded supply for several years. 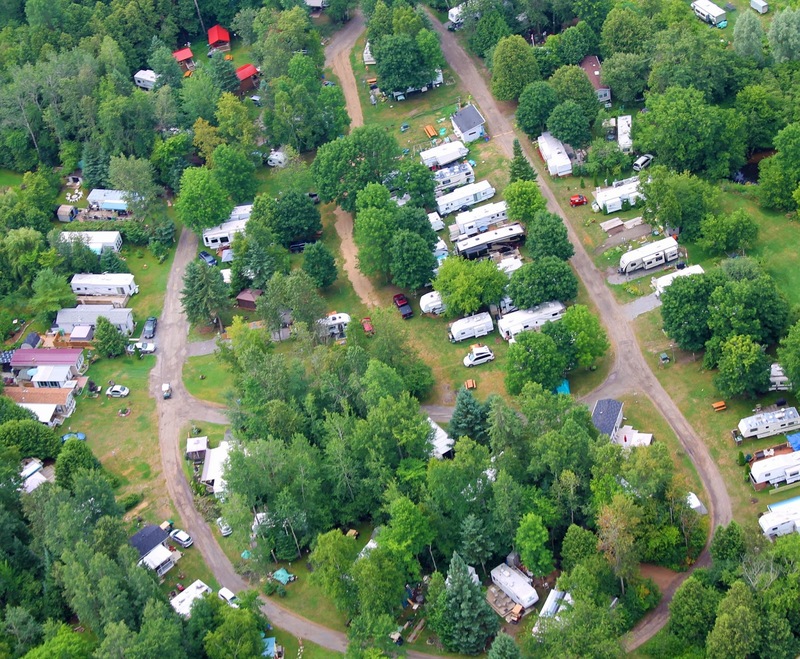 For visitors we keep 25 serviced campsites open for short-term use. But for people who want to keep a trailer here on a long-term basis, there has essentially been no availability for years. This has led to people trying to find ways around our rules. At first, people started booking 8 week "vacations" or every weekend in July and August. So to keep things fair, we had to limit the amount of short-term booking time and institute a rule that people must be occupying their trailer every night if they were booking our transient campsites. Then some folks asked us if they could store their trailer between reservations. Initially it was only a few people for a short period of time. But last year, there were so many trailers being stored in Glen Echo field that it sometimes looked more like a parking lot than a field. People who were actually camping there began to complain. So this year, we will no longer provide trailer storage. There will not be any exception because if we do, everyone will expect it. Of course, doing this will result in lost revenue. But it's about being fair to everyone and looking out for what is best for Bare Oaks overall. Please note that these listings are provided for your convenience. They are not recommendations or endorsements. We have no relationship with these business and have not scrutinized them in any way. Caveat emptor!